Mercedes drivers Nico Rosberg and Lewis Hamilton headed final practice at the Spanish Grand Prix without revealing their true form. 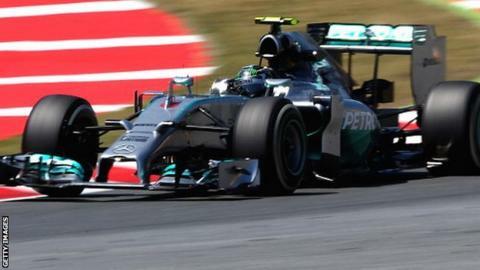 Rosberg set the fastest time by nearly a second, but Hamilton aborted his fastest lap before completing it. Hamilton was still 0.432secs clear of Ferrari's Fernando Alonso, who was in third ahead of Williams' Felipe Massa. The Lotus of Romain Grosjean was fifth, ahead of Red Bull's Daniel Ricciardo and McLaren's Kevin Magnussen. The second McLaren of Jenson Button was eighth, ahead of Grosjean's Lotus team-mate Pastor Maldonado and Red Bull's Sebastian Vettel. BBC F1 analyst Allan McNish said: "The two Mercedes are a big step ahead of everyone else and then after you've probably got the Red Bulls, but the Ferrari of Alonso is also there. "Then it's probably Williams. I'm not 100% sure about Lotus [having improved so much] but we'll see what happens this afternoon." It was an inconclusive session held in more difficult track conditions than Friday practice, when lap times were faster. Rosberg had trailed Hamilton by a significant margin on Friday but was faster on the harder tyres early in the final session, and Hamilton was down on his team-mate after two sectors of his lap on the faster 'medium' tyre before pulling into the pits. Alonso's team-mate Kimi Raikkonen was only 14th, and more than 1.2secs off the Spaniard's time, but the Finn made an error and ran wide on his lap on the medium tyres. Raikkonen was 0.443secs slower than Alonso on the harder tyres earlier in the session. Red Bull had appeared to make a step forward on Friday, when Ricciardo was the best part of half a second quicker than Alonso. The Australian was 0.6secs off the Ferrari on Saturday morning, when Red Bull may well have been running higher levels of fuel. Vettel, trying to make up for losing all of Friday to a wiring loom failure, was 0.2secs slower than his team-mate. The team were experimenting with set-ups and Vettel did his low-fuel run early before reverting to a heavier fuel load for race preparation work. Lotus have had a torrid first four races but are now making steady progress back towards their more usual place in the top 10. They and Red Bull are benefiting from a step forward in their Renault engine, which has improved power and driveability this weekend.